The Oakville lifestyle was, and still is, coveted by many. Its waterfront location, strong economy and beautiful scenery made it an attractive destination. 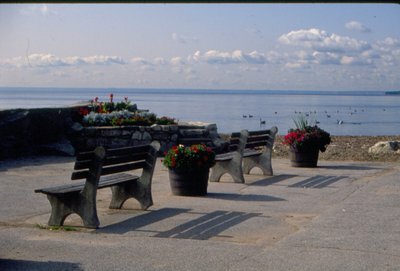 The early residents of Oakville were very much aware of the presence of Lake Ontario. 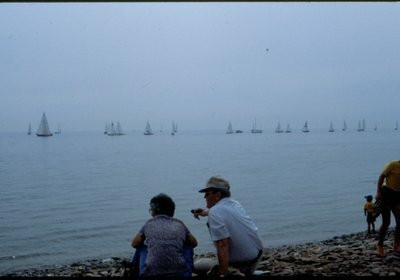 The constant walking that was required of residents to and from their destinations multiple times every day gave them a keen awareness of their surroundings, and a glimpse of the brilliant blue waters of Lake Ontario. The Lake Ontario harbour and wharf at Oakville became a haven for yachts and sailboats of all shapes and sizes. Freight boats, such as those carrying coal and other commodities, also frequented the harbour. 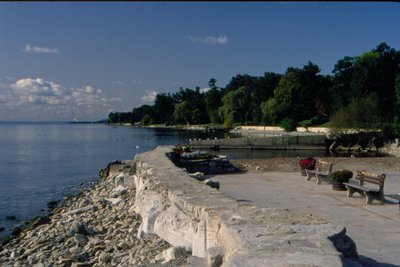 In addition to providing recreation for the townspeople, the lake indirectly played another important role, that of enticing several wealthy businessmen from Toronto and elsewhere to buy property along the lakefront where large homes, stables, workmen’s cottages and beautifully landscaped grounds leading down to the lake became the norm. In fact, so many of these businessmen arrived between 1900 and 1930 that the lakefront became known as Millionaires Row. Family life in Oakville remained very close-knit until the introduction of the motor car. Lacking mechanical diversions, young and old spent hours of their time at home reading, playing cards, checkers, dominoes, backgammon, engaging in conversation or singing and playing the piano. The church held high priority in family life. Work was done manually, resulting in the availability of many jobs. Factories employed many, and the vast number of farms in the district were always in need of help. Road maintenance and utility projects also kept many men busy. The steam whistle blown by the Tannery on the west bank of the river sounded early each weekday morning, calling employees to work, again at noon and at five o’clock in the evening. This whistle was also used as the official fire alarm for the town. The bells of St. Jude’s and Knox Presbyterian churches were quite active on Sundays, and quite distinctive from each other. St. Jude’s chimes played morning and evening for fifteen minutes before services. The frequent sound of steam whistles could be heard at every train crossing. The sound of fog horns from ships passing each other out on the lake, and the electric whistle of the Radial Car as it crossed the intersection at its Randall and Thomas Street station were also frequently heard by the townspeople. In the winter, the town rang with the sound of sleigh bells. Residents took this musical sound for granted, but missed it after it was quickly drowned out by the noise of motor cars. 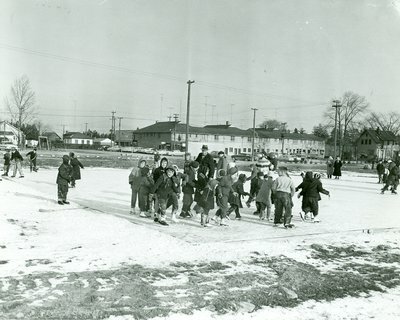 Until the Oakville Public School (Central School) on Navy Street was demolished in the 1950s, the school bell was of major importance to students and a helpful time-guide to others. The bell rang to mark the beginning of school each morning at nine o’clock, lunch hour at noon, the resumption of afternoon classes at half past one, and the conclusion of the school day at four o’clock. The historic school bell which was part of daily life for the residents of Oakville for over one hundred years, escaped demolition when old Central School was torn down, and is preserved in New Central School on Balsam Drive. 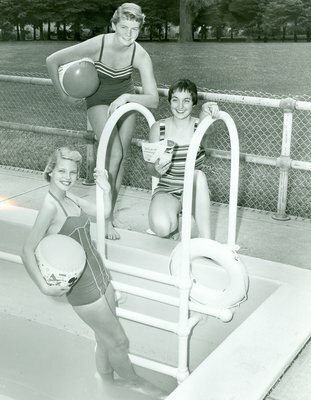 It became fashionable to “summer in beautiful Oakville”. 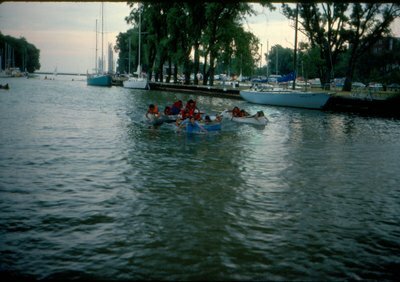 Soon the lakefront became littered with large estates and modest cottages as more and more people joined the summer exodus from the city. But when the summer sun was drowned out by the snow and ice of winter, life in Oakville didn't seem as glamorous. 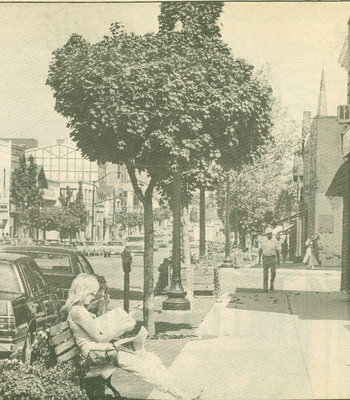 Nevertheless, the town's residents embraced the changes that accompanied winter, especially the fun that could be had on the slippery ice of the Sixteen and Lake Ontario. During the four day cold-spell of February 1881, known as the “Big Freeze-Up", when the lake was covered with a thick sheet of ice that extended fifteen miles out, skaters could be seen gliding out on the lake under the stars. Ice formed very deeply in the 1900s because the river ran free of pollution. Long ice-saws were used to cut square blocks of ice out of the river for use in ice-boxes during the following summer. The ice cutting took place between the Aberdeen and Radial bridges, and the blocks were stored in sawdust within the coal and ice dealers’ warehouse on the east side of the river. Lake Simcoe ice was brought in later to augment the supply in order to keep up with Oakville’s growing population. Also stored along the river’s edge was the coal needed to fuel the town. Mountains of coal which had been unloaded from boats were picked separately according to size for different uses. Owners of rowboats and canoes also made use of the river for recreation. Swimming in the river was also pleasant, and oftentimes warmer than swimming in Lake Ontario. At the close of winter, the shallower upper water of the creek began to move again and a loud noise was heard when the expansion caused the ice of the entire creek to shatter into thousands of pieces. This meant the end of another winter, but it also marked the beginning of a much awaited transition into spring. Even though Neilson's chocolate bars were not produced in Oakville, advertisements for their products were commonly found in various Oakville publications. The ads portray the brand during its humble beginnings, and boast simple statements of quality and value which differ from the bold graphics often seen today. The Neilson's ads pictured to the left, represent a simpler time, and an early point in the progression of the Neilson's brand as it became a household name. Similarly, Christie, Brown & Co. Ld. did not originate in Oakville, but Toronto. 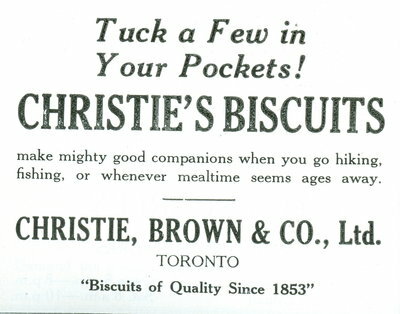 Advertisements for Christie biscuits made their way into the town of Oakville with the promise of only the best tasting cookies. A convenient and tasty snack, Christie cookies were a hit. Children around town would come to know the name, and the Christie Company would develop into the brand we know and love today. Oreo, anyone? The information on this page is credited to: Ahern, Frances Robin. Oakville: A small town (1900-1930). Erin, On: Oakville Historical Society in association with Boston Mills Press, 1981. Print.